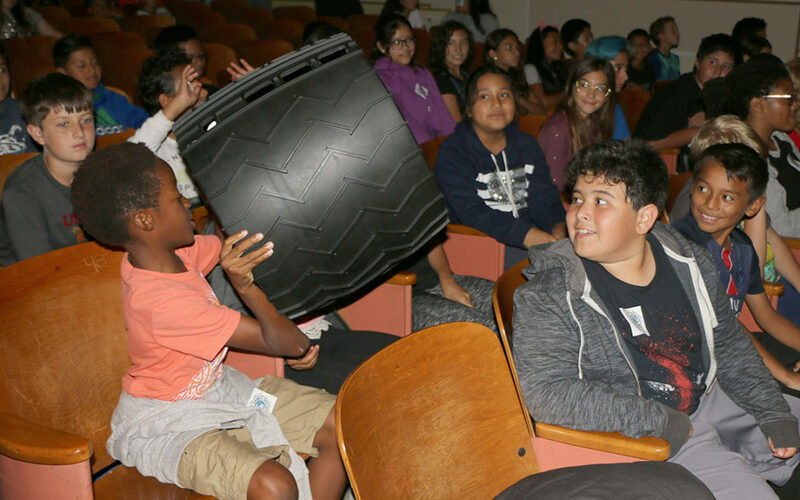 Above: Students examine a wheel designed for “Rover” devices built for exploration on Mars. When STEM programs morphed into STEAM, most schools added “arts” to the focus on science, technology, engineering and math. But, at Palms Middle School, students have joined the #EqualSpace challenge, using their knowledge of science, technology, engineering, athletics and math to develop sporting activities that could be played in space. 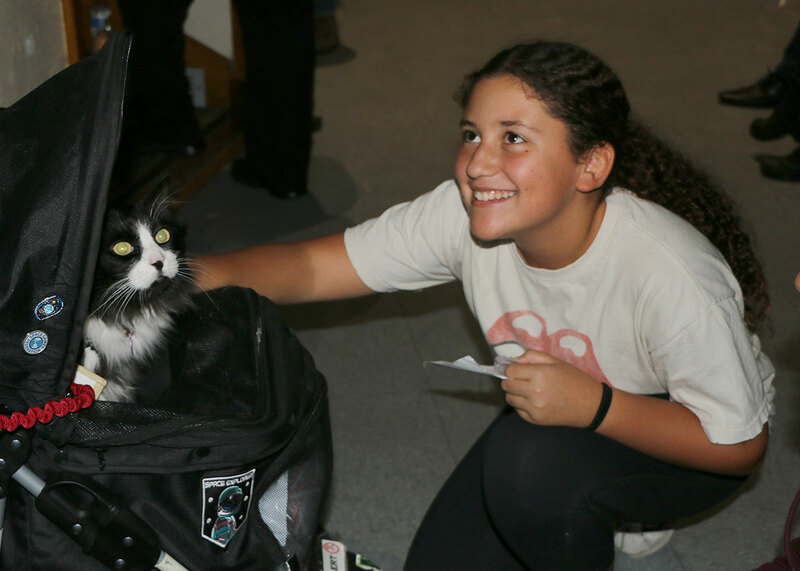 Eighth-grader Elizabeth Huber greets Nicky the #SpaceCat, a medical alert cat who serves as the mascot for Space Games Federation. The federation recently partnered with NASA’s Jet Propulsion Laboratory (JPL) to present an assembly at Palms, where experts in astronomy, athletics and entertainment spoke about matter, gravity and other scientific concepts. 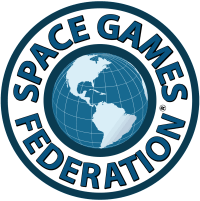 Students were encouraged to submit original ideas about sports that could be played in space for a chance to win cash prizes. Eighth-grader Elizabeth Huber readily accepted the challenge. These are the kinds of questions the school’s guests were hoping to prompt students to consider. Rodriguez said he hoped that students would leave the event realizing how dynamic science can be. Neurobiologist Van Koo, who emceed the assembly, said the day’s significance goes beyond science and sports. Sporting workout gear and a baseball cap with green hair braided into pigtails, Koo does not look like a stereotypical scientist, which is something she hopes resonates with students. 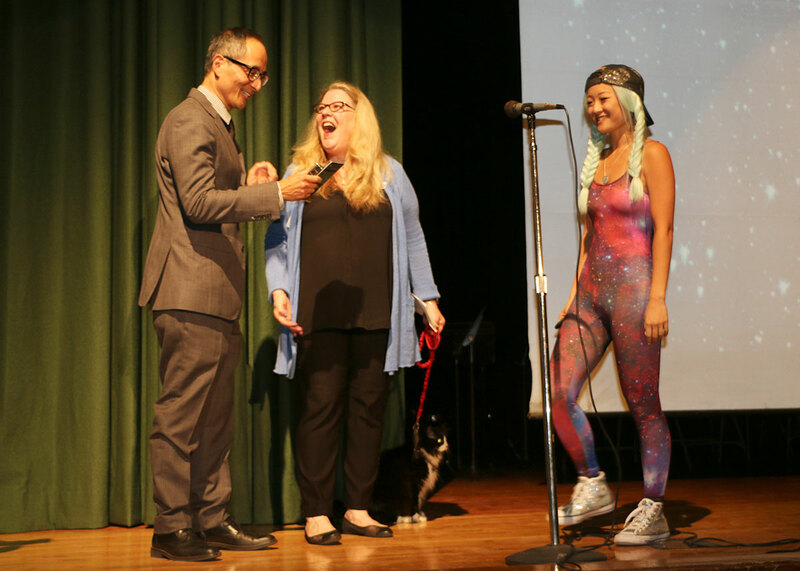 From left, Palms Middle School Principal Derek Moriuchi, Space Games Federation CEO Linda Rheinstein and neurobiologist Van Koo. Rheinstein says her organization intentionally targeted middle school students for its foray into education. 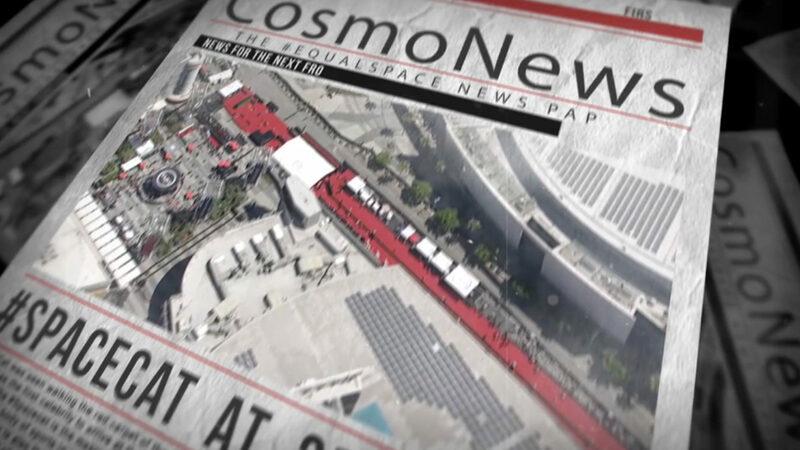 As part of the effort to link students and space, Palms received its own “ISS Above,” a device that tracks the International Space Station and notifies observers when it is flying overhead. 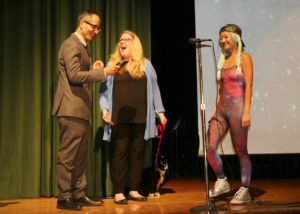 Accepting the device on the schools behalf was principal Derek Moriuchi. The efforts of the school and its partners have already made an impact on at least one student. Written by: Samuel Gilstrap on October 5, 2017.on October 6, 2017.